There are many ways to fry chicken. But this the simply delicious and easiest recipe I have got!! Clean chicken pieces and add salt, turmeric pwd, curd, ginger garlic paste, onion paste and marinate for 20 mins. Boil the chicken mixture on high till the water evaporates, and chicken is half done. Heat oil in a large frying pan, add red chilli pwd, and chicken mixture. Fry on medium till chicken is done, this takes atleast 30 mins. Add Garam Masala and adjust salt. Heat some oil in a small pan, and add green chillies, cashews, and curry leaves. Fry till crisp. 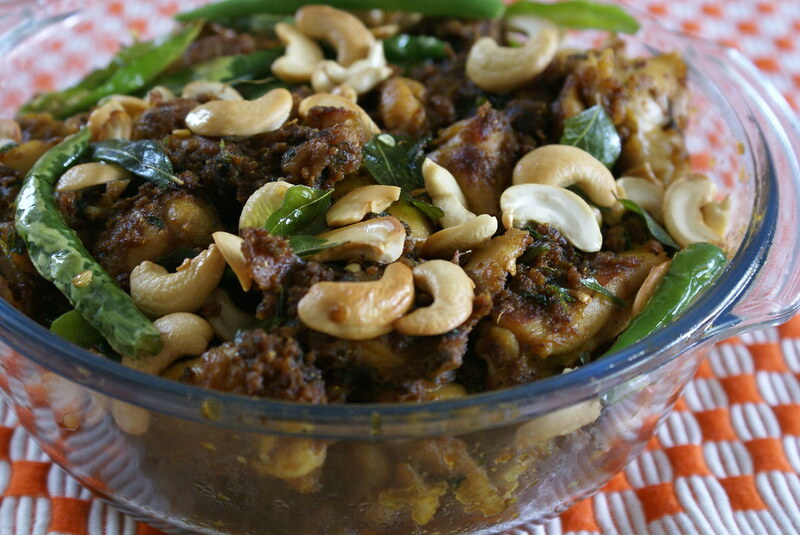 Garnish the chicken with the fried chillies and cashews and coriander leaves. Yummy, Tasty and Spicy and we enjoyed our meal to the last piece!! This looks so tasty, next time we make chicken, this will be it! Thanks for reminding me! Hi, this looks fantastic. Next time I want to try this. Thanks for sharing such a wonderful recipe. hey cinnamon, I usually dont comment on Non-veg recipes. but your pic was so good that I could not resist complimenting you. this one looks so delicious and tempting to eat…. this is one of my favourites my mom used to make.i loved the pics and can i have it? looks very tasty! 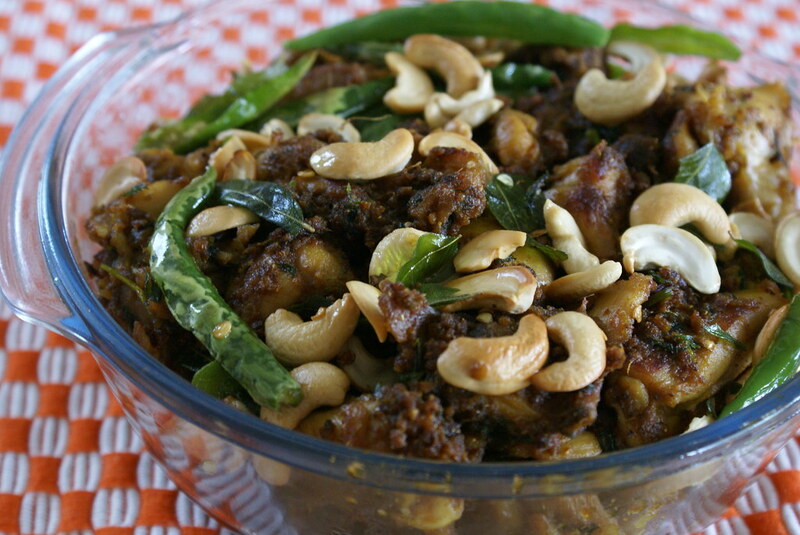 I love the combination of nuts, chilli and chicken! Valli, Do give a try let me know, how u liked it. Sharmi, I was so happy after reading ur comment. Chicken is my favourite and yours looks irresistable! Will surely try. Thanks. This dish is looking great….It is a colourful dish and chicken is my fav….Love ur dish…. Sig, yeah i find it easy compared to other recipes, glad to know u liked ! wow looks tasty and tempting too.I’m a big fan tof chicken dishes.And cinnamon thanks for visitng my blog and posting comments. Chicken looks fab…i was looking for chicken recipes since i want to cook chicken…loved this one. I will let u know how it comes out.